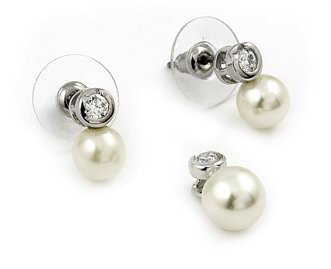 Nickel-free Sterling silver set featuring beautiful synthetic pearls with a complimenting bezel set cz stones. Set inlcudes pendant and earrings. Also includes a rhodium plate finish, which gives it i ts lustrous white gold appearance. All of our cubic zirconia items are also made with Grade A quality stones with a high-shine finish. All of our CZ pieces are always set and never glued on. Depending on the styles, Sarraf.com uses both machine-cut on the styles, Sarraf.com uses both machine-cut and hand-cut CZ stones. Sarraf.com guarantees that our Sterling silver merchandise is 925 Sterling or above.